Toffee (aka Zwar’s Holly and the Ivy, Red Bone, Safety Grrrl, Dribbles, Spunkey Munkey, Little Bear) was born 28 October 1998, and adopted with her step-sister Taylor by Barbara and Scott, then of Sylvan Lake, AB, on 05 January 2008 from AireCanada Airedale Rescue Network. Toffee resides in Edmonton, AB, and underwent Regenerative Stem Cell Therapy on 20 May 2011, with Dr. Scott of the Crestwood Veterinary Centre. 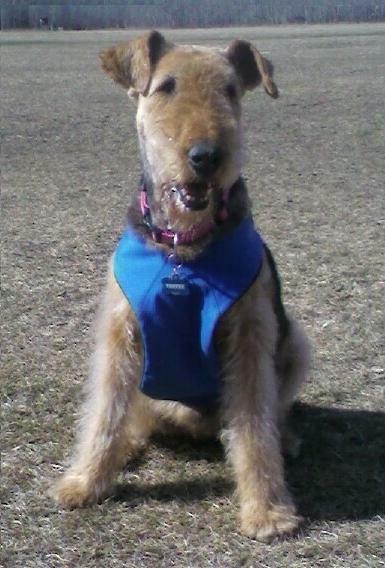 Toffee is the “safety supervisor” behind Taylor’s enterprise Diggers ‘R’ Us – providing landscaping and excavating services to the west-central area of Edmonton. She is also the senior 1/3rd of Edmonton’s Airedale Grrrl Gang since the addition of Ruby Tuesday in January 2010. 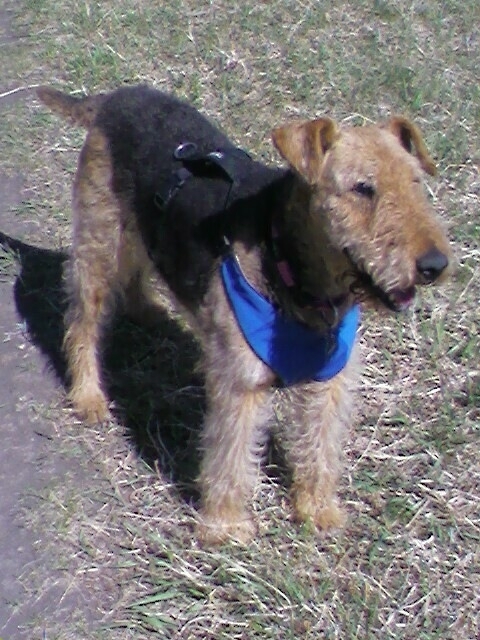 Although she was already taking the maximum daily dose of the non-steroidal, anti-inflammatory medication, Metacam, when adopted at 9 years old, Toffee was so energetic and determined that Barbara was convinced she was heading back to her first family in Calgary (150 k away) every time we went for a walk. I remember one instance when walking off-leash (d’uh, stoopid), I only took my eyes off her for a moment and Toffee was a ¼-mile away and her next stop was the Stampede! When we did move from Sylvan Lake to Banff in 2009, I spent a good half-day back-filling Toffee’s excavations around the acreage. 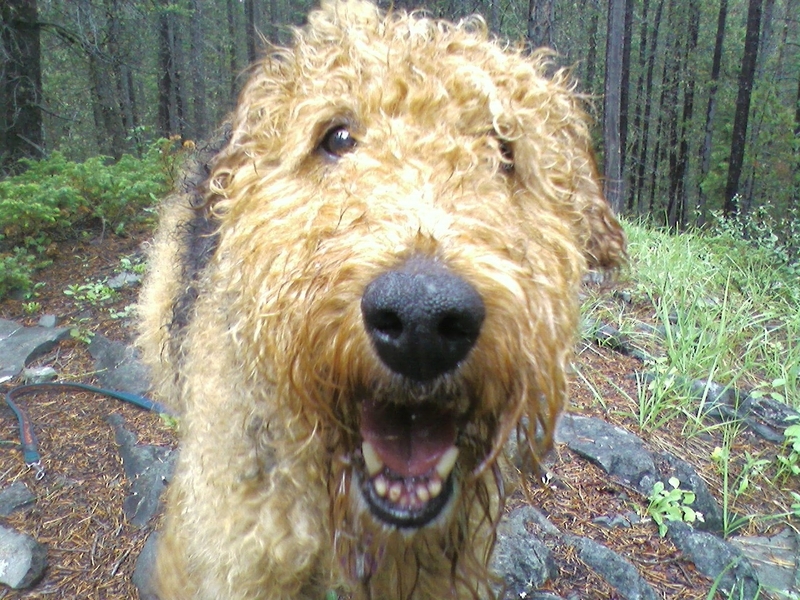 In Banff, Toffee appeared truly in her element: hiking, camping and even mountain climbing! She was also a regular at the Banff Public Library’s Paws for a Story program in 2009/10. Our move to Edmonton in early 2010 meant fewer mountains, but more socializing with Aire-cousin Molly, and new Aire-friends Caitlin, Holly and Charlie, Mia and Monte, and Ginger. But the Metacam and epic winter of 2010-2011 seemed to be taking their toll on Toffee. Although Taylor was, when adopted, and still takes a daily dose of Metacam without concern, Toffee needed more and more meds to address its side-effects. And the prolonged cold weather was draining her capabilities and vitality; we feared the worst come April. Why did we explore regenerative stem cell therapy? In Toffee’s veterinarian’s own words, ”she’s cheeky.” “She responds contrary, and is that small percentage that feels every side effect,” added Dr. Todd Scott of the Crestwood Veterinary Centre in Edmonton. Barbara and Dr. Scott first discussed regenerative stem cell therapy (rsct) at Toffee’s B-day annual amid our concerns she was no longer responding positively to the non-steroidal, anti-inflammatory medication for her osteo-arthritis, was requiring more over-the-counter pain management, was losing mobility and fitness, was shedding weight, and was beginning to show kidney and liver dysfunction. Dr. Scott shared some of the remarkable results he had witnessed through completing the treatment with a handful of patients. He added he was confident Toffee would respond positively even though “she’s cheeky.” But it wasn’t until this spring that two things happened that determined our decision to proceed with rsct, 1) Dr. Scott was able to acquire the necessary licensing in order to perform an in-clinic, same-day procedure, which also had the added benefit of halving the cost of the procedure, and 2) Toffee’s condition had deteriorated significantly. Research is ongoing as to how exactly stem cell therapy works, but what is understood is that stem cells have the ability to develop into many different types of cells, for example bone, cartilage, nerves, and muscle. Early research on these cells originated from human embryos, however, given the legal and moral controversies, embryonic stem cells are not considered for this treatment. Stem cells in their adult form are less controversial as they can be collected from a number of tissues, including skin, fat or bone marrow, and the “host” is not destroyed, as with an embryo. As a treatment, adult stem cells can be easily collected, isolated and concentrated in a single in-clinic procedure, and then used to repair and regenerate tissues throughout the body that may be ravaged by diseases and injuries. For Toffee’s outpatient surgery, her pre-surgical preparation was typical: no food, water or meds 12-hours prior, and a good night’s rest. Her adult stem cells would be collected from her abdominal fat tissue, which would require full anesthetic. She would remain under the anesthetic during the 90-minutes required to isolate and concentrate the adult stem cells through centrifuge, and during the few minutes of surgical introduction. Dr. Scott opted to introduce Toffee’s concentrated adult stem cells to her affected areas through injection and intravenous (IV) drip. His rationale being the injections to her hip joint-capsules are direct application with tendency to more immediate results, while the IV drip provides widespread distribution throughout the body and to tissues not accessible or appropriate for injection, i.e., internal organs, vertebrae and eyes. Of course, the nature and location of the diseased or injured tissues will determine which method of concentrated adult stem cell introduction for best results and patient care. We were able to join Toffee in recovery just after 3 o’clock that day and by 5 we were back home. Toffee had requested to watch her favourite movie Up! that night, and though we screened it she slept through all the talking dog scenes. 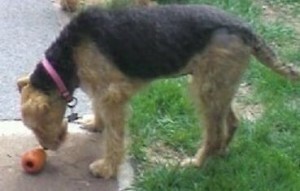 Two weeks before Toffee’s surgery Dr. Scott switched her to Tramadol (synthetic morphine) and off the Metacam. Although she appeared to be in less pain, she was succumbing to prolonged diarrhea…contrary to the most prevalent side-effect of constipation. And although she was drinking, little food was being taken. So following her surgery we were understandably hesitant about resuming the Tramadol; Toffee perhaps seemed to share this concern as she only took one dose during her first three post-surgical days, and only two during those first two weeks. By June 5th, two-weeks post-surgery, she had discontinued the Tramadol and the anti-diarrheal Imodium entirely, and opted for the occasional Lakota (400 mg harpogophytum procumbens). She also continued her Diopred 1% eye drops every third day to combat the fatty deposits she was accumulating around her irises; first diagnosed in 2009. Toffee’s post-surgery was not all movies and discontinuing pain medications. She had an ambitious five-week rehabilitation program, including leashed walks, passive range of motion exercises, assisted sit-to-stand exercises and application of ice after each of three rehab sessions per day. But within a week post-surgery Toffee presented no pain responses to palpation or surprise touch/movement in all previously known arthritis sites: bilateral hips and thoracic spine, however, she now displayed a painful limp favouring her right knee. Apparently masked by the hip and back pain, but now pain free in those areas, her right knee was now able to make itself known. Though Dr. Scott lamented at not knowing about this additional site and thus missing the opportunity to inject concentrated adult stem cells, he was glad he opted for and expressed confidence that the IV delivery would address this new concern. Time would prove him correct as by early June Toffee was limp free, pain response free, and presented unrestricted, assisted and passive range of motion in her hips, knees, ankles, back, shoulders, elbows, and wrists! • walk 60 minutes, daily plus another 20 minute walk that same day! • trot short distances, and make it outside to urinate/defecate. • eat three meals per day, drink occasionally, and start gaining weight. • enjoy a day without diarrhea! • lay-sit-stand unaided and ascend/descend five stairs unassisted. • sleep 10-12 hours per day. • play with Taylor and Ruby again. • keep her tail up and wag it like a Spunkey Monkey! The only thing she struggled with was a sustained squat. and excitement of Toffee and the Grrrl Gang was electric. What are potential treatments with stem cell therapy? Currently joint, bone, cartilage, tendon, and ligament injuries of dogs, cats and horses are being treated with regenerative stem cell therapy; this includes everything from osteoarthritis to fractures. Regenerative stem cell therapy also shows promise for treating a variety of diseases such as liver, kidney, heart, eye, neurologic, and immune-mediated diseases. Remember Toffee’s need for Diopred 1% eye drops every third day to combat the fatty deposits she was accumulating around her irises? Well she also had that cloudiness in her pupils associated with aging. At her four-week, post-surgical check-up Dr. Scott reported the cloudiness was dissipating as was the fatty deposits. Toffee has since reduced her Diopred 1% eye drops to every fourth day and can continue to reduce the dosage as long as she continues to show progress. If only the stem cell therapy could do something about her selective hearing when I call her for time to leave the dog park!? At eight weeks post-surgery, Miss Toffee was still progressing. She re-mastered the sustained squat, could descend 12 stairs and ascend 6 unaided with just a little help to climb the remaining steps. Toffee continued to be able to trot and can even run short distances. 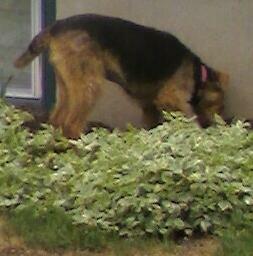 Rabbits frequent our neighbourhood, but until recently were largely ignored by our Toffee. However, on one of our daily walks back then Toffee took notice of a rabbit and gave chase. Most compassionate rabbit I’ve ever seen…assessing his hot-pursuer, he checked his sprinting get-away and eased-up just enough to stay out of reach by matching Toffee’s brisk trot. The encounter only lasted the length of a couple of front lawns before the rabbit took a sharp turn into a back yard, but wow! was Toffee excited that she “almost” had a rabbit! Both days of summer arrived consecutively this year, so how is an Aire-grrrl to celebrate? 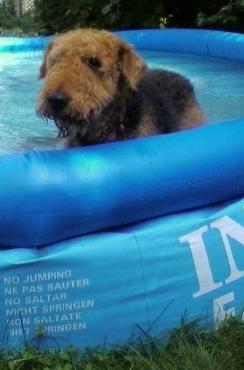 A dip in the backyard pool and a “spa-day” of course. “We’re not Labs! We prefer our water in bowls,” exclaimed Dr. Scott personification when I relayed Toffee’s expression of disgust and distain with her pool experience. Oh well. 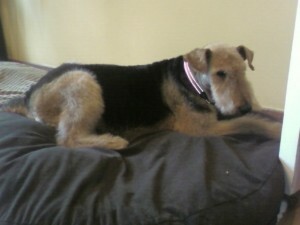 Her “spa-day” grooming experience was much better though. Her grooming in April exhausted her so much she was bed-ridden for two days. This time spa-day also included an hour-long visit to the dog park and staying up late to watch movies. Toffee’s 12-weeker was very positive. She did present some mid-back pain, but her hips and legs remain pain-free with full range of motion and increased muscle mass. Toffee continues to gain weight and is on target at 1 kg per month to reach her goal weight by her birthday in October. Her eyes continue to improve and she will soon progress to taking her Diopred 1% eye drops every fifth day. Dr. Scott reported he felt she had yet to plateau and looked forward to seeing her again at her birthday annual check-up. At that time he’ll draw a blood sample, analyze, and be able to compare to last year’s kidney and liver function which we’re quite looking forward to reviewing. As far as we can tell, our Toffee’s quality of life has improved so much we wondered how we ever wavered on proceeding with regenerative stem cell therapy for her. While we recognize rsct will not prevent minor infections, or address the structural issues, or correct selective hearing and dislike of backyard pools, or reverse time, returning a grrrl with a puppy’s energy, regenerative stem cell therapy has given our 13-year Aire-grrrl a new lease on life and elegance in her senior years. We feel regenerative stem cell therapy has an ever more important role in health care and should be fully explored with one’s veterinary health-care team when reviewing options for your furry family member. • Stem Cells: the next generation in therapy, InGeneron Incorporated. • Regenerative Stem Cell Therapy, Vet-Stem Regenerative Veterinary Medicine. What a story!!! The best of luck to Toffee for a long and pain free life. She has a wonderful pack looking after her. So happy to see Toffee doing so well! You are truly an amazing dog owner. We just moved back to BC and Marlie and Montey are really missing Edmonton. So nice of you to mention them in the story. 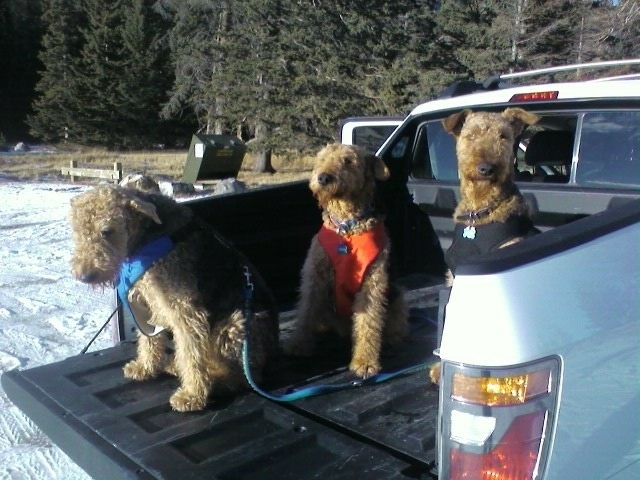 They had so much fun at the dog park and always liked bumping into other Airedales. 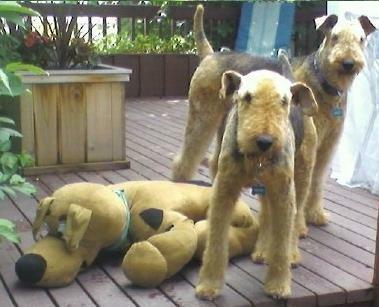 I think by the time we left – we knew all the Airedales in the City! Please keep posting updates. I adopted a 12-year-old border collie/Aussie shepherd cross with the same progression of osteoarthritis and long, slippery, downhill slide. It’s kind of scary how similar the symptoms were. Still, I managed to keep her active until she was 18 years old, and she crossed the rainbow bridge last year. I wish I’d had access to this therapy, but I’m not sure if, as an older dog, she would have tolerated the anesthesia. I wish you and Toffee all the best…e-mail me Baba Ulat! Dr Scott was our vet for our two airegirls Abby and Harriett. Although we moved to Calgary a few years ago, we still miss having him as a vet for our girls. Glad to hear that you found him. I’m glad your experience has been a positive one. Our experience using stem cell therapy (adipose/fatty tissue) is devastating us. Some canine cancers are accelerated if they exist at the time stem cell treatment. One in three dogs will be diagnosed with cancer in their lifetime. There are few canine cancer screens and many cancers exist undetected by their owners. Stem cell companies are not providing adequate warning of this risk in their safety literature as it is not in their vested interest to do so. We were not warned. Our 2 year old Labrador Retriever received stem cell therapy a year ago. He had a mast cell tumor that we were unaware of at the time of treatment. Eight more have developed in the past 12 months since his stem cell treatment including one at an injection site and two inoperable tumors. His oncologists at a well-known teaching hospital have never seen mast cell disease like his and since there is no scientific research to provide data, they do not know if chemotherapy will be effective. How many pet owners have unwittingly put their pets at greater risk by undertaking this therapy? Would most pet owner even suspect that ADSC therapy may have exacerbated their aging pet’s cancer? It is widely recommended to bank stored stem cells for additional treatments that I can only assume would expose pets to further risk and potentiate the impact on some types of undetected cancers. The company that sold the kit to the vet who performed our dog’s treatment is uninterested in his case which only affirms my opinion that their interests are clearly for profit and not for the advancement of research to benefit animal health and well-being. Beware. . .once you unleash them, they cannot be called back! Sounds like something to discuss with your Vet before starting this kind of treatment. Mary’s story above means that anyone considering stem cell therapy for their dog should probably have cancer screening done beforehand in light of her unfortunate negative experience with her poor lab. “BioCurex has announced the availability of the OncoPet RECAF test, which detected 85 percent of a variety of cancers in dogs at the standard 95 percent specificity level in premarket studies.